Someone posted inappropriate contents on my Facebook wall. How do I get rid of it? I noticed that people are posting a special message on Facebook that protects their privacy. How does it work? 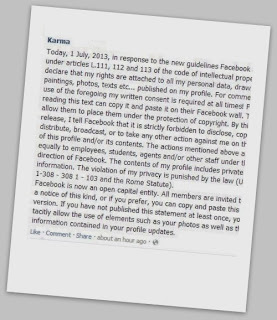 This “privacy” post (see image) has been circulating on Facebook for a few years, in one form or the other. The message uses fancy legal talk, such as “The violation of privacy can be punished by law (UCC 1-308 - 1 1 308-103 and the Rome Statute)” and other such blabbering, which convinces many innocent users to keep spreading the message by posting it on their own timeline. 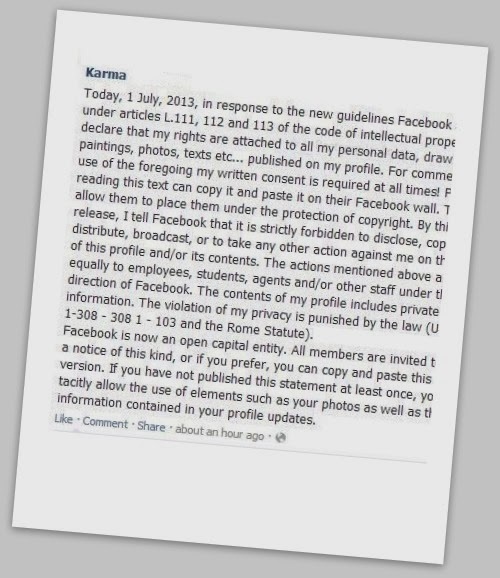 However, this is a bogus message; nothing you post on Facebook can change your privacy agreement with Facebook. As we have heard in the news recently, any material you post on Facebook can be potentially shared with the government of the USA. The only way to protect your privacy on Facebook? Keep private information to yourself and never post it online.